Windows XP has simple volume control box. If you are bored with it, you can get volume control box of Windows 7 for your Windows XP OS made by fediaFedia. 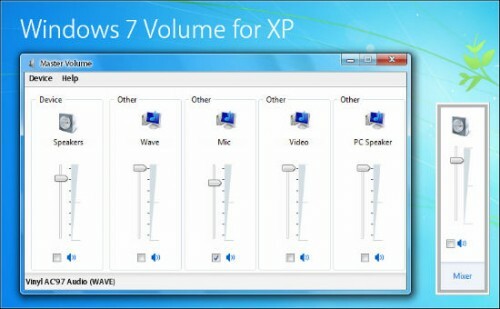 Windows 7 has a new volume control box. Go to C:\windows\system32, find sndvol.exe and make a backup of it. Press Win+R and type dllcache in the box, click ok, copy the sndvol.exe to the window that opens. Then go to C:\windows\system32 again and copy the new sndvol.exe there too. If it doesn’t work repeat that operation. Additionally you can replace sndvol.exe in Safe mode.